Anyone who works in an office will know that when it's time to run to the bathroom, the chances of someone snooping around the computer increases. Whether it's a nosy colleague looking for gossip or a boss checking up on your work, no one wants to be caught out checking Facebook on company time. That's where a small program called WinLock comes in to save you. You may say why not just lock the entire computer using the key combination WIN + L ? Why bother with WinLock? Well, perhaps you don’t want to lock the entire computer. Maybe a colleague will need to use your computer while you are away. Whatever the reason, you can now lock a window and make it disappear entirely from your screen, confident that no-one will be able to access it while you are away. This is a feature that should really be offered by Microsoft, by default. If you can lock an entire operating system, why not a single window? Using it is extremely simple. Once you have downloaded the program, install it onto your computer and when you need it, run it. A small window will open up, with a text field for a password. The default password is 123 but you can easily change the default 123 password to something a lot stronger and a lot more memorable, then click the "Hide WinLock To Taskbar Tray" link to hide the program. : In the main window, set your password for unlocking the window later. When you want to lock a window—whether it is Windows Explorer or a browser window—just bring that window into focus and press the key combination CTRL + Space. Instantly, the window will disappear, not only from the screen but also from the Quick Launch bar at the bottom of your screen. To the casual snooper, it's as if the program is closed. Obviously if a snooper were to check the Windows Task Manager, they would see the program still running, so this is not a foolproof system by any means. But interestingly enough, shutting down WinLock via the Task Manager does not make your window come back, so you can be sure that no-one can circumvent the security that way. When you want to bring the window back, just double-click the program's icon in the taskbar tray and when the program's window pops up again, enter your password. Your previously hidden window will re-appear. It's as simple as that. 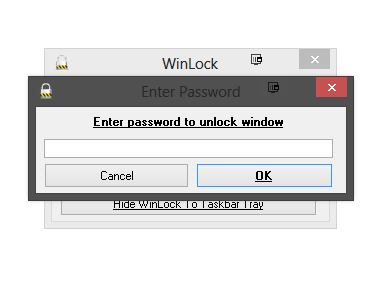 When you are ready to unlock your window, click on the program in the taskbar and enter your password. Your window will then reappear. It goes without saying that this app isn't totally foolproof. Anyone determined enough to break the encryption would be able to do so, given enough time and effort, and your corporate IT department will still be able to monitor your browsing habits if they want to. But if you are only using this in a casual office / family setting, to give yourself some privacy for a few moments while you step away from the computer, then WinLock is a no-frills alternative that should keep you safe from the office gossip. 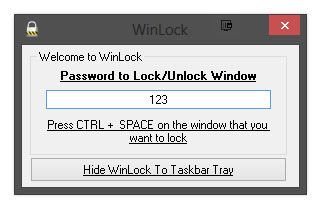 If you want to lock a window (as opposed to the whole PC), WinLock will do the job.